See also "Presence of the Past" [Nancy Saxberg], July 1987, which includes more on architectural features. This building is located next to the Standard Church on the west side of old Highway 16 on the northern edge of the village. The western half, with the verandahs, was built first. The eastern half was added, first as a woodshed, much later in about 1920. The house was a Wallace home from the time it was built. This Wallace family arrived in Canada in 1820 and originally settled in Lanark, but moved to North Gower in 1837. There were no less than three separate families of Wallaces, two Scottish and one Irish, in the area. The Wallaces who settled in lots 18 and 19 of the third concession, where this house is located, were of Scottish descent. By 1879, there were six Wallace households from this family in seven divisions of the original holding. Which house was the original Wallace home has not been established, and will probably be difficult to determine. The present house may have been built by the father of James Wallace [1835 - 1914] who owned it throughout the latter part of the 19th century; if so, it could conceivably date from 1837. It is equally plausible that the house was built by or for James Wallace himself, much later but still before 1867 since it was certified as a centennial home in 1967. This is a wooden house of post-and-beam construction. Under its current  insulbrick exterior 69 is red clapboard. 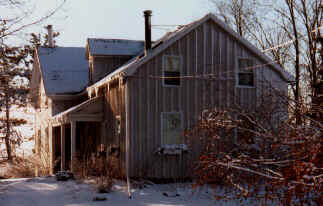 The front of the house does not face the nearest road, old Highway 16, but rather looks across the fields to the Fourth Line. When the house was built, it must have been expected that the road would run to the west of it, and apparently the winter road was often broken that way. However, when the alignment was finally settled, the road went around the back, leaving the building with its unusual orientation. At one time, a series of outbuildings and assorted barns stood in a U-shape to form a courtyard to the north of the house. These have been removed. James Wallace lived and worked on the farm until his death in 1914. In 1904 he passed the title to the property to his son Alpheus, who farmed it until his death in 1943. A verandah was added to the southern side of the house by Norman Good in about 1910, and perhaps at the same time a sunporch was added to the north side. The eastern extension was built about 1920 and hydro installed in 1926. Alpheus' wife Isabella achieved considerable reputation locally as a wedding cake decorator and butter maker. She won numerous prizes for both skills in agricultural fairs. Her granddaughter, Mrs. Sondra Latourell, has a large framed diploma that was awarded to Isabella by the Central Canada Exhibition for a 1920 wedding cake exhibit. Isabella's daughter Norma [Mrs. Mervyn Meredith] estimated that her mother probably decorated over 200 cakes. Two years after the death of Alpheus Wallace the farm was transferred from Isabella to their son Russell Wallace. Russell converted the 1920 addition into a regular part of the house and created a separate apartment for his mother. At some time, the old front door on the west side of the house was abandoned for a new one on the south side. The old front door was framed with a glass transom [overhead and both sides] which was boarded over in the winter. It still exists but is not used. Russell's first wife, Ferne, began to take in a few boarders in the late 1940's and early 1950's and shortly thereafter made it official by putting a sign at the foot of the driveway advertising tourist rooms. The Wallace house became a temporary home for a number of Bell Telephone workers while the switch to dial phones was being made in about 1959. Ferne Wallace died in 1966, the tourist home having closed a few years earlier. Russell Wallace remarried and he and his second wife Verna lived in the family home until 1978 when it was sold. Across old Highway 16, a subdivision street was named Russvern in honour of the couple. In 1978 the Harrisons bought the house, and sold a year later to the Thomases. In 1982 it was sold to the McBrides and in 1984 it passed to the Sheldons. In 1986, April Steele and Gary Railer bought the property and have since restored the exterior. 69 The insulbrick had been removed by 1990 and replaced with grey board-and-batten, which is appropriate to the period of the building.